If you’d prefer, use the convenient form below. Join our email list to stay informed! The Screw Compactor provided by Fairfield is used to reduce the moisture content, organic content, and volume of screening material coming from the shaft less screw conveyor. 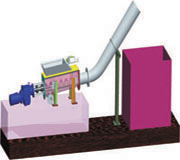 Screening material is entering in an inlet hopper, which will include a mechanical divider that will direct the screening to the compactor. From the inlet hopper screening material will be transported by the rotating screw in to the washing zone. In the washing zone wash water is sprayed through the hollow shaft screw in to the screening material, During normal flow condition compactor shall be operated in forward and reverse direction. The Fairfield service company offers the Screw Compactor manufactured with a through conveying section and screw. The covers are tightly bolted onto the trough and seal the enclosures. During pick load condition the washing process automatically switch to forward direction to handle the large amount of screening with only short interval of reversing, to ensure that the material does not accumulate on the shaft of screw. Discharge piping is provided at the discharge end to dewater the screening. » Screw housing made of Stainless steel 316 and contains removable cover on top. In counter sunk perforations are provided in dewatering zone to allow the removal of filtrate during compaction. Outlet flange provided for discharge and at bottom of housing contain wedge wire section for drainage. » Hollow shaft screw is made of alloy steel which provides sufficient strength. It incorporated with perforation which allows water to be injected in washing zone. » Thrust bearing is made of stainless steel and flange mounted to the drive with o-ring. It provides support to the screw shaft. » Drive unit consisting of TEFC electric reversing motor which is coupled with a helical bevel reducer. » Drain pan is connected at bottom of housing and it has given some slope towards to pan so it can provide easy removal. Flushing nozzle is provided for washing. » Discharge pipe is made of PVC and connected through flange connection at outlet. » Discharge chute made of Stainless steel 316 L and it connects the compactor and inlet hopper. » Control panel is containing solenoid valves and motor terminal strip located inside the junction box. It provides NEMA 4x local junction box and mushroom head EMERGENCY STOP push button. © 2019 Fluid Technology. All rights reserved.